The Lac Virginis is the mercurial medium of conjunction for the union of Sol and Luna at the chemical wedding. At the point of conjunction it becomes one with the opposites and so ceases to be known under that name. Moreover, the philosopher's child, which is born of the union of Sol and Luna, is nourished by virgin's milk, and this is the food which allows him to grow to maturity. This substance is then something which transforms the opposites, transcending their inevitable conflict, and allowing something new to be born in consciousness. In Jungian psychology it is the apperception of the psychic image, the living symbol, which is behind the operation of what Jung calls the transcendent function. It is only after the full painful experience of living with the tension of the opposites that such a movement can occur. Only then are we nourished by the virgin mother which is the unconscious psyche. It is in accepting the helplessness of our ego-attitude in the face of primordial conflict, and thus admitting our childlikeness, that we open ourselves up to this mothering. The son of the philosophers is the divine child, the Self. 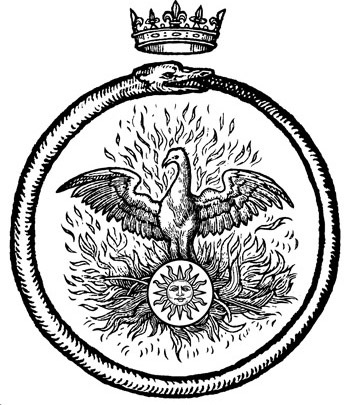 I was granted the lodge charter through a line of succession going back to the occultist Michael Bertiaux, and further back to Crowley and others. This doesn't really mean much to me in and of itself, and if you're impressed by that, we probably wouldn't work well together. As I said, I'm interested in freedom from outwardly imposed authoritarian structures. However, this specific tradition has evolved into a non-heirarchical one, and it is nice to have a network of others involved in the same work for support and resources. I am a very practical magickian (mercury/mars in capricorn) and am more interested in taking action than in armchair theorizing. I am, however, always interested in learning, discussion, new information and alternative points of view.